* Mama Margaret, Land of the Gods Italy expert & developer of this tour, will co-lead the first tour on May 12-18, 2015. * We can custom design this tour for you and run it for dates you want. This unique, extraordinary cooking and wine tour of private, small group experiences takes you off the tourist path on the Amalfi Coast and beyond to the Campania region’s top wine country and to Paestum, home to magnificent Greek temples. In fun, authentic, rich adventures, get to know an incredible variety of local people in their kitchens, lemon groves, vineyards, farms and wine cellars, and even some water buffaloes. Cook with three delightfully different people: an excellent home cook on their farm of lemon groves above the Amalfi Coast, a friendly chef at his restaurant in Ravello with absolutely stunning coast views and a lively woman on her farm near Paestum where she owns 900 water buffaloes. Indulge in lemon pastries at one of Italy’s top pastry shops after a beautiful walk down through picturesque hamlets, lemon and olive trees to the sea. Visit a prestigious winery high above the coast with 400 year old vines and two top wineries with exciting, one of a kind cellar “décor” in the Altripalda and Taurasi areas. In Paestum watch artisan cheese makers go through all the steps in making mozzarella cheese and eat the freshest mozzarella you’ve ever experienced. Of course, you also explore Amalfi, Ravello and Positano with your local guide/friend and learn about local life and lore. Description: Arrive at Naples airport or train station. 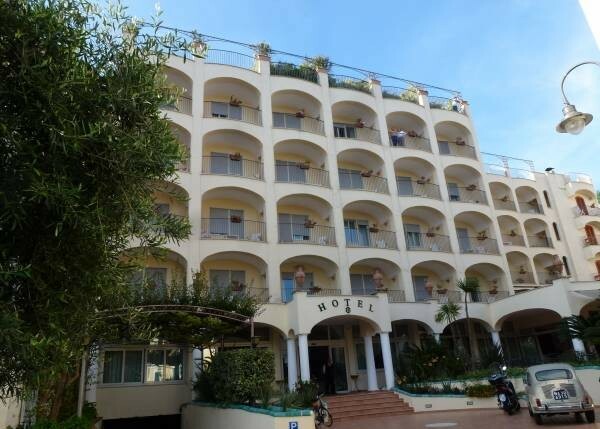 Private group transport to your four star hotel in Amalfi Coast town, Maiori. Get settled in your Amalfi Coast style room with local ceramic tiles, cherry wood and wrought iron furniture and specially selected fabrics that breathe the magical atmosphere of the coast. On your balcony, marvel at lovely sea views. You’re just off the beachfront promenade and two minutes from the hotel’s private beach with small pool. Maiori has escaped the tourist masses of the Amalfi and Positano and attracts Italian families to its long, white sand beach. Definitely an authentic Italian feel! In the early evening, your local guide meets you for a leisurely walk through the town and a welcome drink. We’ll give you suggestions for where to enjoy dinner on your own. Description: After breakfast at your hotel, leave with your guide in a comfy minivan for nearby Minori. Visit remains of the ancient Roman villa, a summer home to Roman nobles. Drive up into the hills above Minori to a delightful family’s agriturismo/farm inn, set on terraces of lemon trees and vegetable and fruit gardens with spectacular hill and sea views. With the mother, you cook hands-on flavourful dishes of local, seasonal products, many right from their land, dishes that respect ancient food traditions. They also raise pigs, rabbits and chickens. When you dine on your creations on their panoramic balcony, you drink wines made from the family’s grapes. Of course, you eat divine, home-made desserts, especially lemon ones! In the afternoon, drive to Amalfi, once a powerful Maritime Republic, to discover the town with your local guide/friend on a guided walk with free time to explore. 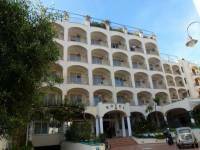 Return to your hotel in Maiori. Evening and light dinner on your own. After your multi-course lunch, you’ll want to eat light! Description: Drive for about an hour from Maiori to higher hills in the Avellino area, home to the Campania region’s only three DOCG wine zones: Fiano di Avellino, Greco di Tufo and Taurasi and Campania's top wine region. Visit the famous Mastroberardino winery, family run for 10 generations by wine industry pioneers and innovators. When other wine producers were planting non-native grapes like Trebbiano, Mastroberardino remained loyal to their roots and used only local grape varieties. They make reds and whites from the Taurasi, Greco di Tufo, Fiano di Avellino, Falanghina areas and even inside Pompeii. Tour the winery and taste their wines, consistent prize winners. When most of their winery got destroyed in the 1980 earthquake, they rebuilt it adding stunning frescoes by many artists in its beautiful cellars, making it a very special winery destination. Drive about 40 minutes to the pretty Taurasi wine country to visit a uniquely designed winery in rocky caverns with fun, intriguing décor featuring old wine barrel staves. Over lunch on their panoramic terrace, drink their excellent wines. Return to Maiori. Dinner on your own. Description: After breakfast, drive up to Ravello on a plateau with magnificent Amalfi Coast views, so beautiful that someone called it “where poets go to die”. Guided walk of the town, its 1000 year old cathedral and lovely Villa Rufolo gardens. Cook with a chef in a family-owned restaurant with stunning panoramas of the sea, hamlets and cliffs falling to the sea. Before you cook in their special cooking school kitchen, take a dip in their swimming pool a few steps away and gaze at the views. Today’s class is all about Amalfi Coast lemons! Expect plates like pasta with lemons, lemon cake! Dine on your creations on the panoramic terrace. Can life get any better than this? 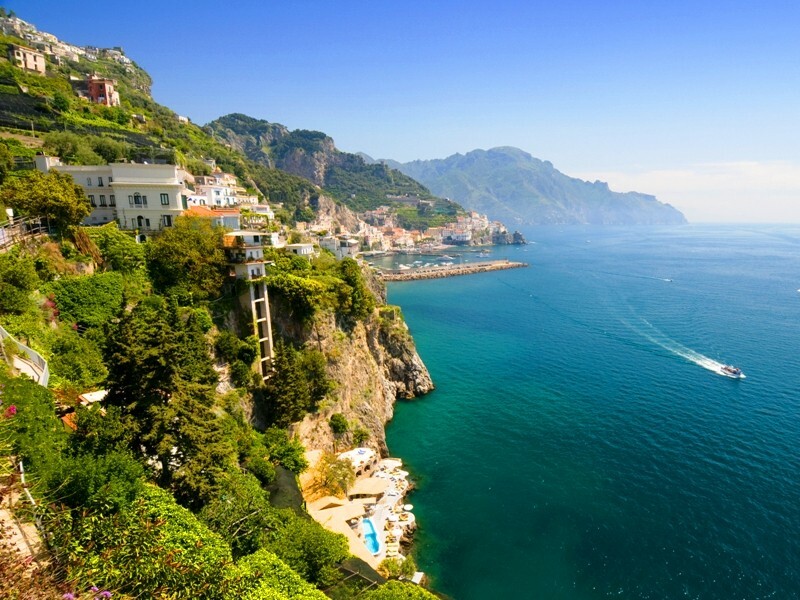 After lunch, take a beautiful one hour walk down lots of steps from Ravello, through quaint hamlets, by ancient churches, lemon trees and down to Minori, with splendid hill and sea views. To celebrate your walk, stop in Minori at one of the most famous pastry shops in Italy, Sal De Riso, for a decadent cake and limoncello. Return to Maiori by minivan. Light dinner on your own. Description: Leave Maiori at about 7:00 a.m. to go to Paestum and witness how artisans make mozzarella cheese from water buffalo milk. Travel about 60-90 minutes. Production starts about 8:30. See the steps they go through right in front of you. Taste their mozzarella cheese. 10:00 – 11:30 Drive a short way for a guided walk in the archaeological park to see magnificent 5th and 6th century B.C. Greek temples. Visit the museum with sculpture, wall paintings, pottery and history of Paestum if you wish. Drive a short way to a family’s 18th century estate in a house that takes you back a century for a cooking class with the lively, locally born Baronessa. Visit some of their 900 water buffalo whose milk they send to mozzarella cheese makers, and tour their extensive vegetable and fruit gardens with a member of the family to learn about local ingredients. Possible dishes with mozzarella cheese: pizza in their wood-burning pizza oven, vegetable lasagna, eggplant parmesan or pasta with tomatoes and ricotta. Desserts like almond & chocolate torte. On the way back, stop in Vietri, the Amalfi Coast town famous for its ceramics. Visit a ceramics factory to see how they make Vietri style ceramics with free time to shop. Return to your hotel. Evening and dinner on your own. Description: After breakfast, drive into the hills above Maiori to Tramonti. Visit a lemon and limoncello producer full of infectious enthusiasm for his work and land. Walk with him among the lemon groves, learn about lemons’ life cycle, see how to make limoncello and maybe pick a few lemons. Fascinating! Enjoy drinking limoncello right with the producer. Drive into quiet, green Tramonti wine hills, where time seems to have stopped, to visit a winery and its vineyards. Some thick vines are 400-500 years old! Enjoy a country lunch of traditional rural dishes with their prize-winning wines, all made of local grapes. 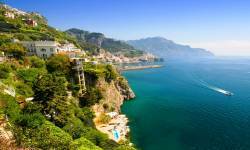 An off the beaten path slice of life of the Amalfi Coast! Drive to Positano for a guided walk among the colourful clothing, shoe, ceramic and lemon product shops. Stop at the top of the town and walk to the main beach. Return to your hotel. Farewell dinner at a restaurant to celebrate your week of friendships, local life experiences and cooking accomplishments. Description: Reluctantly leave the hotel after breakfast for Naples airport or Naples. We can also help you to arrange travel to other places. If you’d like to extend your stay and visit Capri, Pompeii and beyond, just let us know so we can arrange it all for you.